March 24, 2016: What to Do When You Have a Difficult Class by Jim Gomes is the #1 viewed item in Education World's newsletter. March 17, 2016: Jim's popular article What to Do When You Have a Difficult Class is featured on Education World. ​April 4, 2016: Special thanks to Dr. Salinitri, Associate Dean Pre-service for the opportunity to address her advisory group. It was a lot of fun playing The Name Game and sharing classroom management tips and strategies from my book..Good luck to all in the final weeks, summer break is on its way! November 8, 2015: "Innovative Tips for Successful Parent-Teacher Conferences" is listed as one of the most popular articles on this extensive website for the past week. For the past 10 days, it has been featured on their home page! November 4, 2015: Education World features "Innovative Tips for Successful Parent-Teacher Conferences"—taken from Ready-Set-Teach! Jim's post becomes the most read article in the Professional Development category of their weekly newsletter. October 26, 2015: Ready-Set-Teach! becomes the best-selling book on the entire FriesenPress bookstore. Special thanks to all my readers who helped make this a reality. MAY 14, 2015: Ready-Set-Teach! is now for sale at the university bookstore for $16.95. 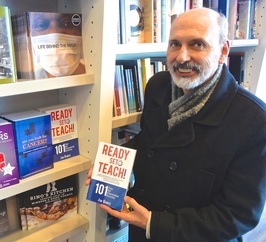 Special thanks to Martin Deck and Jackie Imeson—University of Windsor Bookstore staff for all your help and ongoing support. May 9, 2015: Looking forward to meeting you at INDIGO in Tecumseh from 1- 4pm. The store is located next to the Lakeshore Cinemas at 194 Commercial Drive. 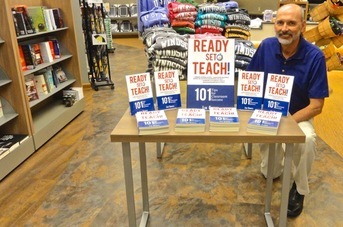 Ready-Set-Teach! makes a great gift for the teacher in your life. Bring a friend. Mar. 28, 2015: Jim's book is now available at Indigo in Tecumseh. You'll find it right behind the cash desk in the Local Interest section.